FIRST Illinois Robotics will be hosting the Illinois Tesla Championships, the state robotics finals, on Saturday, January 26 at the Activities and Recreation Center (ARC) on the University of Illinois campus. The event is open to the public free of charge. 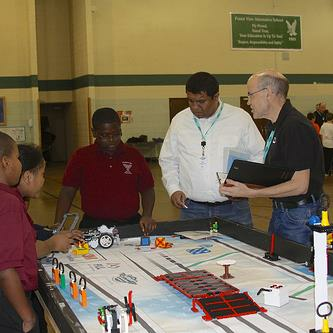 More than 300 students ages 9 to 14 representing the top 48 teams in the state will descend on Champaign to compete in the finals from 1-5 pm Saturday. The competition began with more than 550 teams, who competed in qualifying tournaments throughout the state. FIRST® LEGO® League is a friendly, high-tech event that challenges young participants to learn together as teams. The theme this season is Into Orbit. Teams have programmed and built autonomous robots, using the LEGO® Mindstorms system, to perform a number of challenges. Teams have also completed a research project and have identified a human or social problem faced during long duration space exploration within our sun’s solar system and proposed a solution. The overall winner advances to one of the FIRST LEGO League World Festivals where teams from around the globe compete. This year’s World Festivals are April 17-20 in Houston and April 24-27 in Detroit.